Peseta is always found to be sleeping, or at least only half-awake as she shuffles from one place to the next. She sleeps very deeply, too, so even yelling or knocking her out of a seat aren't guaranteed to wake her -- only her accurate internal clock gets her up when she needs to amble onto/off the school-bus, or into the shower in the morning. It's hard to tell who someone is when they're rarely conscious, but she seems most content when she's got something (or someone) in her arms to squeeze, and when soft music is playing. She has decent recognition for sounds, so she's more at ease if familiar classmates or family members are talking around her. Likes: pillows, big turkey dinners, warm cream, pudding, Disney songs. Dislikes: caffeine, loud noises, nightmares, onions, being cold. Although Peseta comes from a Mexican family, she was born after their immigration and has never been to Mexico. She lives with her parents, grandparents, uncle and aunt, cousins, and two older brothers. They're a busy bunch who rarely have time for her, but they sometimes put on movies or music for her to listen to, so they get along alright. Peseta's brothers used to try to pick on her, but her lack of reactions took a lot of the fun out of that. Her hair is typically tied back with a blue ribbon that makes it slightly less unruly. 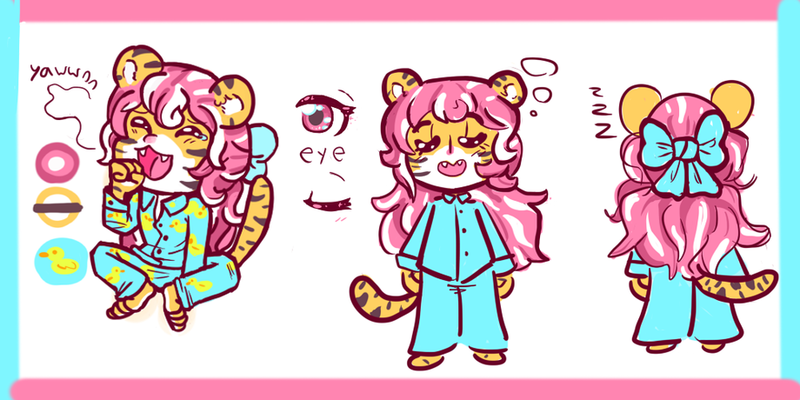 Came up with her core concept (girl who's always sleeping) and named her in the summer of last year. Mainly got stuck on her species for a long time... But now she's here, and ready to sleep her way to the top! I am not fully certain what to think of this character...but she is cute at the very least, and has a touch silliness about her. So she gets my favs and attention. i think she'd be one of my fav characters of yours. i think she'd be one of my fav characters of yours. Alo, what's an oneirosexual?